We’re a BAFE registered fire alarm company with a specialist team of fire protection technicians trained in the design, installation, and maintenance of all types of fire systems. There are wired and wireless fire alarms you can read about on this page, choose depending on new fitting or retrofit, and there’s also Fire Extinguishers and Business Fire Alarm Repair & Maintenance. Fire alarm systems Dorset businesses have protecting their premises can provide companies with the earliest possible warning of an emergency situation developing. As a fire starts, facilitating the swift and safe evacuation of people from your business premises is crucial. Every second saved through early fire detection will make a massive difference to the ability of your business to fully recover. As per our Burglar Alarm Systems, hard-wired fire alarms are mainly installed in new build properties and those larger spaces going through renovation. This is due to the complex building and electrical work that takes place when wiring an alarm system. 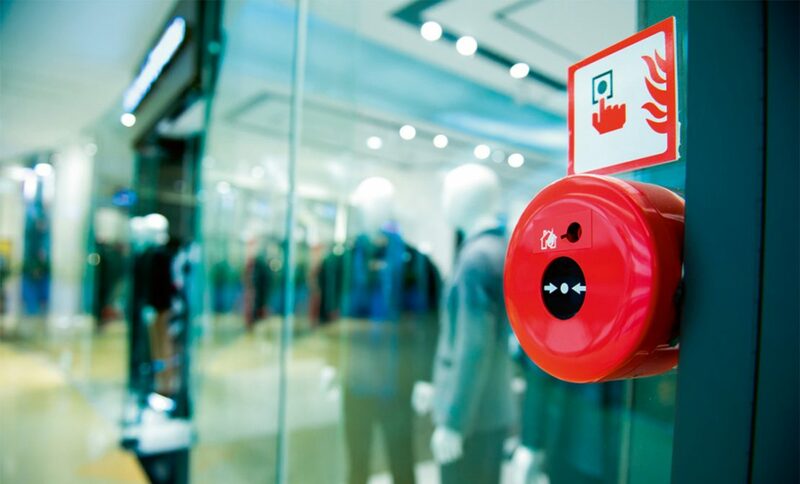 Wired fire alarm systems are suited to large retail spaces, industrial units, offices, and hotels. The smart fire detection technology we use has limitless capabilities and can be designed to work for all kinds of properties, big or small, no matter how complex the installation may be. We can also integrate your fire alarm system with your current security system to give you an all-round complete fire and security solution. Working smarter and more efficient in the long term to meet your business risk requirements and ensuring that company assets, staff and visitors are protected 24 hours a day, 7 days a week, 365 days a year. The popular choice if you have smaller premises are wireless commercial fire alarm systems. They don’t have the complex, labour-intensive installations like their hard-wired counterparts and they’re just as compliant with British and European Standards. Wireless fire alarm systems are suited to small and medium retail spaces and smaller industrial units. With no cabling between detectors, sounders and call devices, there’s very little disruption to business premises during installation, which we often find is an important aspect in certain environments. As battery technology continues to advance and with the smart parent-child device relationships, wireless fire alarm systems are a reliable and compliant solution providing you with complete fire protection for your business. For more advice, speak to one of our fire and security experts today on 01202 743231, or submit an enquiry below.